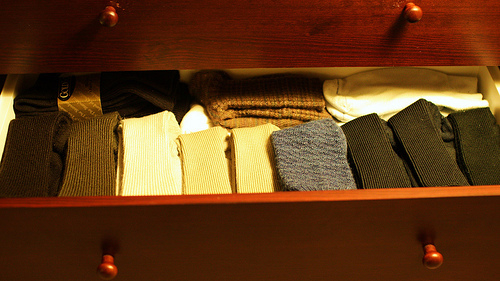 You have 12 black socks and 12 white socks mixed up in a drawer. You’re up very early and it’s too dark to tell them apart. What’s the smallest number of socks you need to take out (blindly) to be sure of having a matching pair? Three socks. If the first sock is black, the second one could be black, in which case you have a matching pair. If the second sock is white, the third sock will be either black and match the first sock, or white and match the second sock. 6 Comments on "Blindly Picking Socks"
Only three. You will either get three of the same color, two black and one white or vice versa. To be 100% sure and to be able to bet ur life on it u need to take out 13 socks! Sorry, misread! I thought it asked for a black pair, not a matching pair. Yeah, it is 3 then! you have to pick 25 socks because there are 24 of each color. There are only 24 socks in the drawer.